Or maybe, we haven’t all been there.....but I have, and so has Bear. For humans, taking a bath or a warm shower is an act of relaxation – a time to wash off the dirt and the stress of the day, and an opportunity to bask in warmth. For a dog....not so much. For most dogs, the act of jumping into a tub for a lather and a rise, followed by a blow dry are not acts that follow the patterns of their natural instincts. 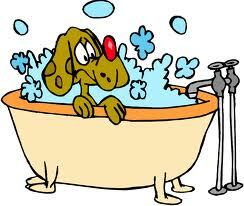 In fact, for the most part, we bathe our dogs to make OUR lives more comfortable. You can compare this with how you’d evaluate a vet’s office. In the nature of things, there will be occasional mess: hair on the floor around a dog being groomed, or a super-anxious or un-house-trained animal may have eliminated. Look for frequent sweeping and prompt cleanup. No dogs lingering in soiled cages, please. Yes, there will be some barking, but I would hesitate if I heard loud music blaring from the speakers – loud, jarring noise contributes to stress in animals. If the shop handles both cats and dogs, the species should be caged well away from each other, ideally in separate rooms. Barking dogs scare most cats; the groomer who takes that into consideration is a groomer mindful of the comfort of animals she’s responsible for. Ask how the groomers respond if a dog struggles, growls, or snaps. You don’t want to hear any variation on “We do have to get tough with some dogs,” or “We just show them who’s boss.” Confrontational, coercive responses have a high probability of making matters worse – both escalating aggression in the moment, and making the dog’s response to grooming and other handling worse in the long term. You really, really, really don’t want to hear a groomer tell you that they give sedatives unless these are provided by the dog’s guardian and prescribed by a vet expressly to help the dog remain calm for grooming. By all reports, sedation by groomers is disturbingly common. It also constitutes the practice of veterinary medicine without a license: illegal, unethical, and dangerous. Many or most groomers will use a “grooming noose” to help restrain a dog on the grooming table. This is okay, as long as dogs are never left unattended even for a moment. The loop should tighten only to a pre-set extent, so a dog who struggles isn't actually being choked. The best responses to your question about a fractious dog will mention gentleness, giving the dog a break from the grooming session, not rushing the process, distracting the dog with treats or rewarding him with treats when he tolerates handling, and stopping if the dog is overwhelmed. Ultimatley, before you leave your dog with his groomer, make sure that he (or she) is comfortable with the environment. The act of being groomed by a stranger is stressful enough on your pet, you want to make sure that you take all the steps necessary to minimize the impact of that stress and leave your dog feeling refreshed and happy when all is said and done.